We are provide wide range of Absorption Systems. We are use high quality of raw material. These systems are commonly used for the purpose of solute recovery or solute removal in different industrial application. Our company holds expertise in offering premium quality Industrial Absorption Systems to our valuable customers. These systems are commonly used for the purpose of solute recovery or solute removal in a different industrial application. Due to their compact design with very high recovery or volume ratio, these systems are highly demanded in the market. Compact design with very high Recovery/Volume Ratio. 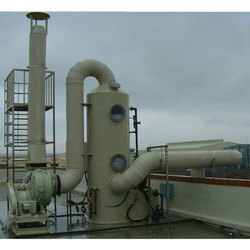 Low flow resistance with more area ensures proper scrubbing of unwanted gases. Durable and less maintenance demanding. Low flow resistance with more area ensures proper scrubbing unwanted gases.